I’ve thoroughly enjoyed and benefited immensely from the Dressage Rider Training programme. 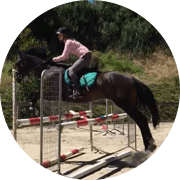 My core strength and flexibility have both improved significantly and this has translated into greater stability and effectiveness in the saddle. The inclusion of both strength and mobility exercises provides variety, and Nicola ensures that their relevance to riding is clear. The work on the Swiss ball is great fun, and the (apparently unscheduled) guest appearances of Nicola’s horse and dog in some of the videos are a most amusing added bonus! Often it is the rider who is holding the horse back from improving through the grades, not the other way around. Are you spending a lot of time and effort in trying to become a better horse rider but you just aren’t seeing any improvement? This can be extremely frustrating for you to not be seeing the results you want. 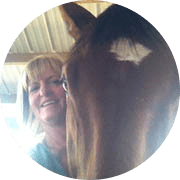 You could be spending a lot of money on horse riding lessons from coaches, but if you don’t have this one special ingredient, then there is something else holding you back. You see, it takes a lot of strength and stamina to ride a horse and compete at any sort of level. The horse riders such as Mark Todd and Andrew Nicolson who compete at the Olympics are very fit athletes, and for them to compete at the level they do, they work on their fitness and core strength every day through riding and specific core training. Riders from all over the world have completed this program & loved it. Keep reading to see why. The better you are locked into your saddle and can move with the horse, the freer your horse will become. Your horse will relax through the back allowing it to have a much better stride. The more correct freedom and suppleness you create in your hips and spine the more you are able to absorb the movement of the horse and the two of you can move together in harmony. As soon as you create the strength, fitness and stability in your own body, the sooner you can do the same for your horse. 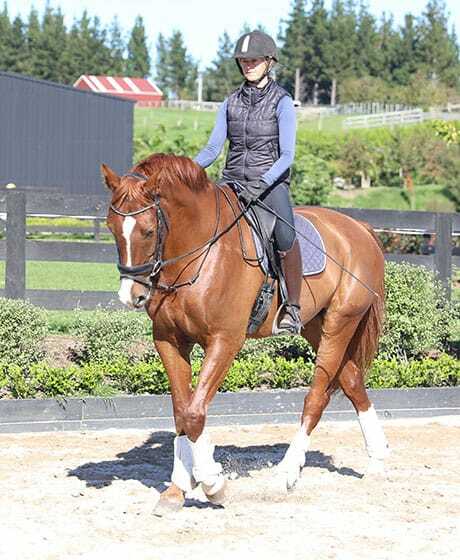 Core strength is the single biggest ingredient that most dressage riders lack, and if you want to progress to the next level in your riding, then you need to pay as much attention to your own physical core strength & fitness as you do your horses. 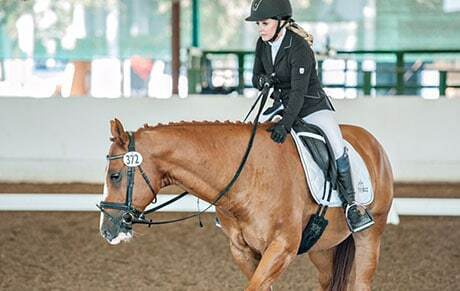 This is what this Dressage Rider Training program will give you. I have loved doing the program. It was so easy to roll out of bed, turn on the laptop and do my exercise. I think it has given me more control over my body when I am riding, and has also toned me up. I feel great, and for the first time in ages, I don’t wake up feeling stiff. I will definitely sign up to the next program. When purchasing you will receive login details to our website that contains the program. Each week you will receive an email with everything you need to do that week, with links to the workouts and resources to do that week on the website. On the website you can download the video workouts to do, or you can push play and stream them on your computer, laptop or mobile device, the same as a youtube video. Yes, you can download each workout individually to your computer, or you can order a USB Drive at any time throughout the program that gets delivered to your door. It contains all the video workouts and resources you need to do the program offline. Please note there is an extra cost for this. No, the workouts are not live as such, you can do them when they work best for you in the week. Nicola suggests Monday, Wednesday and Friday, but she stresses that you can absolutely move them around to suit your schedule. The program is flexible in this way. The workouts are approximately 20 minutes long and you have 3 to do each week. Nicola has made this so they are achievable and can fit into your full days. There are also optional homework exercises, both on the horse, and off the horse. Is this suitable for beginner fitness levels? Yes absolutely! Every workout has options to make it easier if needed, and you can ask Nicola for help modifying any exercises if you have specific limited movements due to a previous injury or the like. Can I do this program if I have had a hip or knee replacement? Yes, we have had many participants who have had hip or knee replacements complete this program. There are options to manage this, and you can ask Nicola for help at any time if you find there is something you cannot do. There is always an alternative! Can I repeat workouts & go at my own pace? Yes absolutely. Some participants choose to repeat Phase 1 of the program (first 4 weeks) until they feel ready to progress. So you are more than welcome to work through the program at your own pace. There will always be others who are at the same stage as you. You will have 6 months access to the program on our website, giving you plenty of time to complete it. After this you can download the program to your computer to keep, or order the USB Drive. Then it will be permanently yours. Do you provide support & guidance? Absolutely! I am here to help you every step of the way. We also have a fantastic community of past and current participants both on our website and private Facebook Group. They provide motivation, encouragement and support to each other. Because everyone is on the same journey and shares the same passion. You will love it! We focus on developing a good foundation of functional strength, mobility & core activation. We do this through three 20 minute routines each week along with some stretching and mobility homework using a foam roller. I also include some simple things to add to your daily ride to also help with your riding posture. 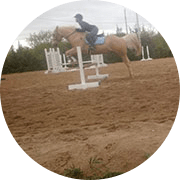 The focus moves to further developing your rider strength and fitness, working on the muscles that riders require for good posture and strength. The same 3x 20 minute workouts, but now your strength has increased from Phase 1. We keep challenging you, introducing Resistance Bands to help with this. In this final stage we add in more progressive exercises for strength & balance. You have the option of introducing a Balance Ball if you wish to take your workouts up to a new level. In this stage you will start to notice the changes in your riding with all your hard work paying off. Each week you will have one 20 minute core workout to complete. 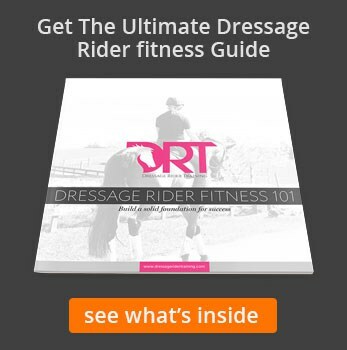 This contains dressage specific core exercises to strengthen your mid section & your seated position in the saddle. Each week you will have one 20 minute mobility workout to complete. This combines yoga & stretching to free up your spine, hips & shoulders. Achieving flexibility & suppleness is the objective. Each week you will have one 20 minute rider strength workout to complete. This workout focuses on your overall strength of your legs & sling muscles to improve your endurance & energy levels. Each week you will have some specific homework to do. 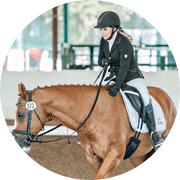 This may include some extra stretching, mobility work, or something to focus on while riding (for example riding without stirrups for a period of time). For those living rurally, I know that internet can be a right pain sometimes! This is why all the videos are downloadable. You can simply download them right to your desktop and be able to play them without having to worry about using up data or internet dropping out and the videos not playing. Save all the trouble of downloading the program & save on your internet data. This USB Drive is delivered right to your door. It contains the complete DRT1 program in full 1080p HD. All the video workouts and resources you need to do the program offline, and saves you hours of downloading the workouts yourself. To order the USB Drive, you can select it on the checkout page as an optional extra. The price of the USB Drive is $39 + a small shipping fee. This program can be done without any equipment. However to get the most out of the program, we recommend the following pieces of equipment that are inexpensive, but will make a huge difference to your success with the program. We give you the option to order these after registration, or at any time throughout the program if you wish to use these. This is used for self massage and improving the suppleness of your muscles and remove any stiffness. We use it as a recovery tool to help your body feel great at the end of each week. This is introduced in week 5 of the program to increase the resistance and help get your muscles, ligaments and joints stronger. If you do not wish to use one of these, then there are options within the workouts that allow for this. Introduced in week 9 (Phase 3) of the program to improve your balance, co-ordination and alignment. It replicates the dynamic and unpredictable movement encountered in the saddle, and improves your ability to adjust. The program has been great. The yoga has also been quite relaxing and a good way to start or end the day. The best advice you gave in the beginning was to make the workouts a priority or they would not happen. The first 2 weeks it was exciting, but week 3 it started to slip, so having you in my head, saying MAKE time for them, was really helpful. My riding trainer says I am doing well and improving each time she sees me on the new horse I ride who is MASSIVE 17.2 and used to being held in and together. I started riding him around the time the course started. I am able to be balanced in myself and allow him to find his own way of going and encourage him to move through his body as I am not leaning on him for balance. He is moving more freely and starting to swing his tail. 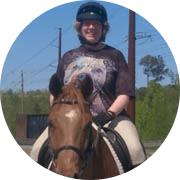 Despite regular riding of two horses both moving into the FEI levels, I knew I had to do more and I did not have the additional time to go to a gym or regular fitness classes. This program turned out to be perfect not only because I could fit it in, but because it made so much sense to me. 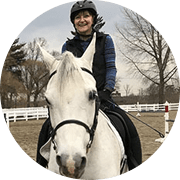 I could link every exercise back to being in the saddle and I have seen tremendous improvement on many levels but particularly with my balance and ability to recover my balance while riding. The inclusion of both strength and mobility exercises provides variety, and Nicola ensures that their relevance to riding is clear. Thank you so so so much for providing answers I never thought I’d find in my riding, or that I thought would take way way longer to develop. I think it has given me more control over my body when I am riding, and has also toned me up. I feel great, and for the first time in ages, I don’t wake up feeling stiff. I will definitely sign up to the next program. This is Gabe, my 7 yo ottb. We have been together for 31/2 years. Never would have seen myself on a young TB but he is the perfect gentleman. 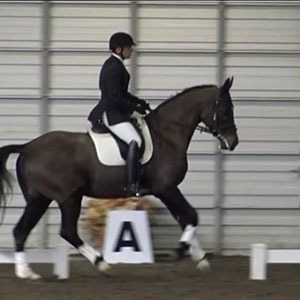 Riding dressage at 56 yo has it's challenges, especially on a young horse and an inexperienced rider. DRT was just what I needed to improve my athletic abilities, particularly core and balance. I looked forward to my workouts daily. I accomplished things I never thought I could be capable of: Hindu squat, balancing on Swiss ball, and 30 days of stirrup less riding. Can't wait for # 2! Thank you so much! 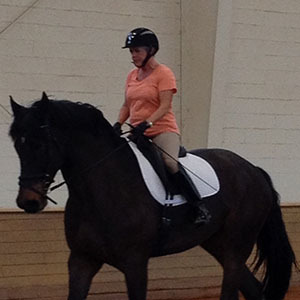 Dressage training is a fantastic program! It is refreshing to find a personal trainer that knows how to coach and optimize biomechanics exercises for the equestrian athlete. The videos are easy to follow and the time commitment fits into your busy schedule. I would highly recommend this program to both the beginner and advance dressage rider! Thank you Nicola. I’d have to say the number one thing I’ve taken away from the program is… confidence! I don’t have a horse of my own, but like to ride the same school horses again and again since I can better predict their ways. Since starting DRT, I have started on four new and different horses, the ones I always thought were ‘above my level.’ And I accepted these horse assignments without freaking out. Ha! The program was fabulous. For someone coming back from an injury, the program definitely helped me regain not only my confidence on my horse but also the muscles and skills necessary to do so. Both of my trainers have commented on how much better I am in the saddle than I was before the program. Prior to the program, I had always been afraid to canter. Further my stamina was not nearly good enough and I was not pushing Stormy enough. Now we are cantering, and I am in better shape than my horse! The two of us are working on increasing her stamina for cantering now and are looking forward to riding in some shows this summer. Here is a photo of me and Memphis. I loved your program and I would sign up for a second round! My riding is also really improved. Love the exercises and stretching. Especially love the core workouts! I signed up not quite knowing what to expect – and wondering if I could anticipate real results from an online course. I can now report that I have noticed a meaningful difference in my overall strength, flexibility and balance. This is all the more important to me as work commitments this past quarter have meant limited opportunity to ride – being able to put in effort at times that suit me has meant I feel I am continuing to work at improving my riding despite the challenges of daily living. I am really enjoying the workouts, especially the core strength ones. Love the fact that they are only 20mins! I appreciate your descriptions of how to do each exercise and the muscles each is targeting. I also like the way you give ‘level of difficulty’ options. I always try each level then choose the one that is challenging, but not excruciating!! The encouragement and positivity you give is also terrific. It does feel as though you are in the room - something I found surprising. Then this program came along and the improvements started happening at an unbelievable pace. My body stability, balance, core strength, symmetry, and flexibility improved, which allowed me to become much more independent in the saddle, improving my feel, making my aids lighter and clearer, allowing me to relax more, which made riding so much more harmonious and fun for both me and my horses. It was a big missing piece of my puzzle. A must for any Dressage rider! I mean every word! Thank you for this transformation! My name is Nicola Smith. I am a qualified Functional Diagnostic Nutrition Practitioner and CHEK Level 2 physical trainer with a University degree in Physical Education. I have been involved in the wellness industry now since 2002. I am also passionate about dressage riding. This is my horse Lucy. As an online personal trainer, I have helped many people with their health, fitness and core strength. 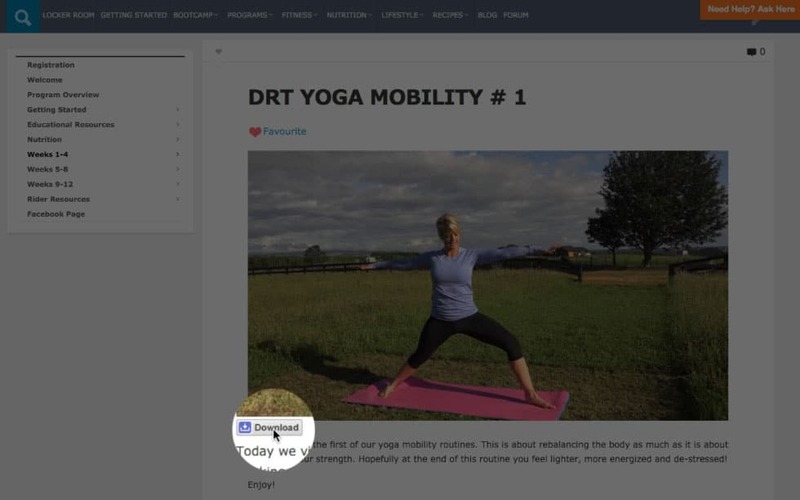 Foreverfit.tv is my website, home to my blog where I help educate people on real health and wellness. It is my vehicle to share what I can with you to help you achieve health and wellbeing for yourself. I run an Online Gym which is a membership based website providing members with nutrition, motivation and workouts to do from home or wherever it suits them. We have members throughout the world, an amazing community of likeminded people who help and support each other on their health and wellness journey. I've actually managed to do all of my workouts on schedule and have really liked them. I have also done Week 5 and really appreciated the step up in difficulty as I workout pretty regularly and these were challenging! The Phase 1 was good to help my build body awareness and be more conscious of how I was standing or moving. Really helped to think about neutral spine all the time (even at work). I've noticed that my core is stronger when I ride and that the homework has increased my flexibility so I'm excited for the next phases to build even more strength and endurance for those horses that take a lot of leg and core to keep moving! But I like the challenge so far in Phase 2 so I'd say keep that up! Really liking this program and when my workout and riding time is very limited, I've made this a priority and seen results! Thanks! The DRT program is phenomenal! Thanks so much for making this program available to us!!! 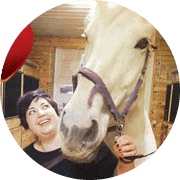 This is a program that combines Nicolas knowledge of scientific core conditioning and strength training, with the biomechanics of dressage riding. 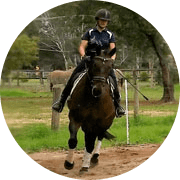 In this course Nicola shows you the different muscle groups that are required for riding, ways to activate them along with exercises to increase mobility and proper function. When riders train the correct muscles and increase the strength and stability of their core they become much more efficient and balanced riders. Discover the biomechanical relationships between different muscles groups, and how when they are working correctly you will prevent back pain, maintain good posture and achieve optimal balance and performance when riding. 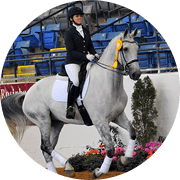 We are so confident you will love this Dressage Rider Training Program that we are happy to offer you a 30 Day Guarantee. We want you to be happy with this program. If you start the program & find it is not what you expected, you can ask for a full & complete refund, no questions asked. We strive for honesty & transparency, we simply want you to be 100% confident in your decision to try this program. 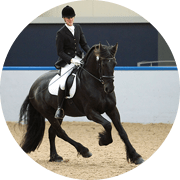 Upon purchase, you will be given login details to the Online Gym website that contains the Dressage Rider Training program (you will notice that when you login the URL is at foreverfit.tv and the website is called the Online Gym). 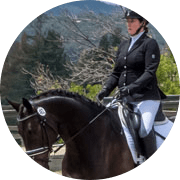 The Dressage Rider Training program is contained within the Online Gym as an exclusive program that standard members will not be able to access. However your purchase of this program will allow you to access ALL other areas of the Online Gym as well for 6 months. 1 - You can download ALL course material including videos & workout plans at any stage. As you will have purchased this DRT program, it is yours to keep & you are absolutely entitled to download it. We show you how. 2 - If you like everything the Online Gym has to offer, after 6 months passes you can choose to continue as an Online Gym member for a monthly or yearly fee, & your access to the DRT program will remain for as long as you are an Online Gym member. You do not have to decide which option to choose now, I would recommend you start the program and decide once you near completion. P.S. Do not underestimate how much your horse will notice your stronger core when riding. Your horse will move more freely, becoming more athletic and dynamic. Also physically your horse will get less back problems due to your improved riding position. 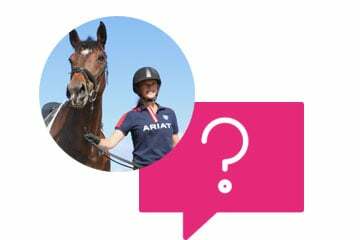 "If you have any questions regarding the Dressage Rider Training program, please do use the chat box to send a message. I would love to hear from you and help as best I can."